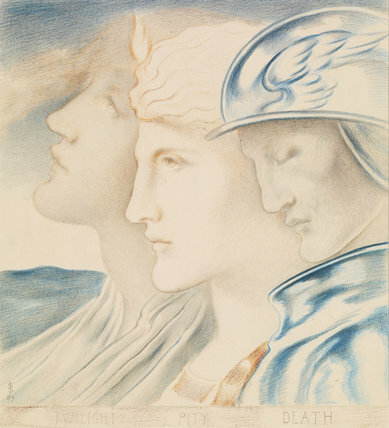 Heads and shoulders of three figures of ambiguous gender in profile to the left; figure on right probably male. The figures, each with a title written in capitals underneath, recede in line from the right. 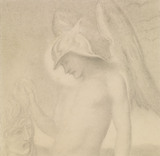 Death wears a winged helmet and chest armour, with eye closed and head lowered. Pity, with a tear falling from an open eye and a small flame shooting from the top of the head, looks forwards. Twilight looks up towards a darkening sky. Pencil, blue and red chalk on paper.